There’s another wonderful headline. Everyone has something to say about Romaine lettuce and pathogenic E. coli. Everyone I know anyway. I do not spout pseudoscience, but I have previously written about our first Romaine recall of 2018 here, and I use credible sources for my information like CDC and FDA. The United States is currently in a second E. coli O157:H7 outbreak linked to Romaine. Our friends to the north in Canada are with us in this outbreak too. The CDC reported on November 26, that 43 cases in the US have been diagnosed across 12 states, with 16 hospitalizations and no deaths. The illness for at least one person has resulted in hemolytic uremic syndrome (HUS), i.e. kidney failure. The outbreak started the beginning of October, and more cases are expected to be reported. Romaine is currently not harvested from Arizona. The first 2018 outbreak of pathogenic E. coli was traced to Romaine grown in Arizona. It took some time to detect, but the source of the Romaine for the current outbreak is California, not Arizona. In fact, the search has narrowed to six counties in California where Romaine was grown and harvested. Where was my Romaine grown? In the last outbreak, family members were asking me if they really had to throw away the old Romaine in the refrigerator and the fresh Romaine they just bought at the store. Yes! All Romaine was discarded in the supply chain. Growers, processors, stores and restaurants are understandably upset at having to dispose of Romaine again. Thanks to government and industry working together, FDA is urging processors to label Romaine with used by dates, harvest location and harvest date. Do you remember the outbreak of 2017? Yes, we were in a similar spot a year ago with an E. coli outbreak in the United States and Canada. Data pointed to leafy greens, but the source of the outbreak was never found, and a recall was never announced by the FDA. Canada’s traceback investigation landed on Romaine as the source. In the US, there were 25 cases across 15 states with the outbreak starting the beginning of November. By the end of February, two people had HUS and one person had died. Canada saw 42 cases and one death. Are all these E. coli the same? No, and Maybe. No. The FDA states that the E. coli O157:H7 from the first outbreak of 2018 and from Arizona Romaine is different genetically from the E. coli O157:H7 of California, like non-identical twins. Close, but not the same. Genetic analysis indicates that illnesses reported in this current outbreak are caused by the same strain of E. coli O157:H7 seen in a previous outbreak that occurred in fall of 2017 that affected consumers in both Canada and the U.S.
Smart people are working on this problem in the United States and Canada. In the meantime, toss away any Romaine you have in your refrigerator. Recalls are stressful situations. The Preventive Controls for Human Food rule under FSMA requires a written recall plan. Recently I received a call and a company had an adulterated product from a source overseas. The call started with an attorney and ended with company management over a series of conversations in just days. The outcome was a Class III recall, and it was not a danger to human health – just an ingredient that was not for use in the United States. The company took all of the right actions and, even though a tremendous amount of work was put in over a short period of time, the proper actions were followed. This is why mock recalls are so important for the viability of a company. Knowing what to do and having an internal team and external advisors can and will save time, money, and possibly a brand if handled correctly. “Recalls are actions taken by an establishment to remove an adulterated, misbranded or violative product from the market. In other words, a product for which FDA or a state could take legal action against the company would be subject to recall. If a company withdraws a product that does not violate food law or the product has not entered the marketplace, these situations dealing with quality issues are not usually considered recalls but may be considered a stock recovery or market withdrawal. Three classes of recalls are defined based on the potential health effects. • A Class I recall is the most serious and involves product that has a reasonable probability of causing serious injury, illness or death. • Class II recalls may cause temporary illness that typically resolves in full recovery. For Class II recalls, death and other serious consequences are not likely. 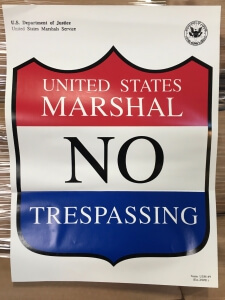 • Class III recalls are not likely to cause illness but are still in violation of the law. Typically, a company voluntarily conducts a product recall, either on their own accord or at the request of FDA or a state. The largest factor in determining a recall is understanding your hazard analysis. If you do not understand where a person is reasonably likely to become injured or ill then your company cannot fully implement a product’s recall. There are many factors that work in conjunction with one another to establish when a recall should be implemented. You must understand your process and what products are coming in as ingredients and what products are leaving your facility. A Class I, II, or III recall may not even be your company’s fault from the beginning. For example, a company could receive an adulterated ingredient or could have been shipped the wrong labels. However, a company could also be at fault because they did not properly check their labels or they could not have followed another preventive control that allowed for a product to be potentially harmful to the consumer. I have been involved in a Class I recall where the manufacturer had data that led the regulatory authority to believe that a raw material came from a supplier that had a pathogen in the raw material. At this point, the game changes because a company must find and isolate any potentially adulterated product. They must then work with the recall team to make sure that specific product has not been sent to the consumer until such time as proper testing and evaluation of the product has been conducted. These recalls are time consuming and are tough decisions that must be made – but ultimately the safety and the security of the food supply in the most important factor. A recall plan must have a hazard analysis and dedicated team to make sure that an effective recall, if necessary, can be completed with maximum efficiency. There are many ways to have your written documentation to prepare for a recall and there is an abundance of work that must be completed before, during and after a recall. If you have a recall you must be prepared for one and understand the impact, you must be ready to act and you have to have programs in place to implement documented corrective actions. ConnectFood.com has recall planning tools available for companies, so if you need help we are here for you to contact at ConnectFood.com. Let’s spend some time addressing a topic that not one single food manufacturer or distributor enjoys discussing: product recalls. Let’s face it, a product recall could be one of the largest headaches your company has to face, but if completing a smoothly operated and well-organized recall means no consumer gets ill or passes away, it is worth the preparation and action. Mock recalls are a vital part of your company’s food safety chain. The way you plan for an event, such as a recall, will determine how the event will go in the case of a time-sensitive emergency. To begin, “what is a mock recall, and why do we need to do one?” Jumping right in, a mock recall is a test run at carrying out a product recall and a way of finding the insufficiencies in your written recall plan. During a mock recall, a consultant or simply your facility manager will oversee the process of what a specific product recall would look like. The overseer will take a good look at your recall team -who you have assigned to each task, they will double check the phone numbers and contact information for your U.S. Food & Drug Administration (FDA) representative, the statement you would release to the public, etc. Ultimately, they will make sure that your facility would be able to smoothly execute what your documentation outlines without straying from your written food safety and recall plan. A mock recall can be conducted as a scheduled event or as a surprise to the facility employees. Of course, there are advantages to both. Scheduling your mock recall will ensure that you’ve organized your documentation to the best of your ability, and can run the mock recall with absolutely no surprises or hiccups. This will be your “best case scenario” situation. However, springing a surprise test of your emergency preparedness system will give you a more accurate representation of how equipped your facility is for an emergency recall. Think of this as your stress test – you’ll find the holes your recall team’s plans that may not have caught in a controlled, scheduled test. It is entirely up to you which plan of action you’d like to take. Document everything! We at ConnectFood.com cannot shout this statement loudly enough from the highest rooftops! As you’ve read in prior posts from us, CEO Matthew Botos frequently says, “If you didn’t document it, you didn’t do it.” This includes your mock recall testing. Record it all – what went well, what did not go so smoothly, the original plan, and the newly edited documentation. Being able to provide documents describing your emergency planning to an FDA inspector during an audit will keep your company compliant with the requirements of your written food safety plan. The FDA released an updated set of requirements in May 2018 regarding recalls, which can be found here. This regulatory procedures manual outlines exactly what your facility needs to have prepared as part of your written recall plan. This manual may be 87 pages long, but it is necessary information for your food safety manager and recall team to be familiar with. Review and get comfortable with what is required as a part of your recall plan – this is what you will assess during your mock recall. Though FSMA does not require a mock recall as part of your written food safety plan, take a moment to think of the chaos your facility could avoid by choosing to get ahead of the issue. Brian Honigbaum of Quality Assurance Magazine says “practice makes perfect” in his article on mock recalls, and he is absolutely correct. The more effort and seriousness you put into your mock recall, the more prepared and confident your facility will be in the case of initiating and carrying out a product recall. Recalls are high-pressure situations, but you can be prepared to handle the stresses and surprises with a bit of preparation. Want more information on recalls? Dr. Kathy Knutson, Ph.D., Lead Instructor for Preventive Controls for Human Food (PCHF), Preventive Controls Qualified Individual (PCQI), wrote a series of “Recalls: Lessons Learned” blogs for ConnectFood.com last summer just for you! Check them out here: Part 1 & Part 2. ConnectFood.com can help you get your recall team, hazard analysis, and recall documents organized and in place. If you need assistance with any of these items or would like to schedule a consultant to conduct a mock recall for your facility, contact us. We are here to help you achieve the utmost food safety status. Johanna Seidel is an administrative member of the ConnectFood team, where she works as manager of operations and manager of social content. She is a certified Preventive Controls for Human Food Qualified Individual (PCQI). She received a Bachelor of Fine Arts Degree from West Texas A&M University in 2016. When she is not working food safety, Johanna also works as an instructor for The Chicago School of Ballet. August 8, 2018 /by Kathy Knutson, Ph.D.
Dry operations are tricky. They are called dry operations not only because the finished product may indeed be dry, but also because water is the enemy of the products. Water creates a greater risk for the pathogen Salmonella in the environment. When I think of dry operations, I think of dry ingredients: powders, spices, gums, thickeners, vitamin and mineral blends, flour, salt, and sugar. All food companies have dry storage for these dry ingredients; I am not addressing storage here, but processing and manufacturing of these ingredients. For every dry ingredient purchased by a food facility, there is a food company making that dry ingredient. Being from America’s Dairyland (Wisconsin), I have been in five different spray-dry facilities in the past two and a half years that were producing spray-dried milk or whey – or both. Dry. Nut roasting is dry. Peanut butter operations are dry. Chocolate – as an ingredient and chocolate manufacturing – are dry. Water is the enemy and creates an environment where the risk of Salmonella is greater. This brings us to cleaning and sanitizing. For most of dry operations, production does not stop. (Everyone working in a wet-clean operation just gasped!) It’s true. If the equipment can keep running, it does. There may be short shutdowns for minor repairs or adjustments, but the equipment keeps running. Most of these dry-ingredient manufacturers do business on a small profit margin and can’t afford to shut down. When the equipment does go down for cleaning, it is a big deal and may take days or a week to clear the lines, make repairs, clean, sanitize, completely dry, and start back up. Most companies discard a substantial portion of the first product out in case a pathogen in the lines was cleared at start up. The cost to the company is significant. Then there is the equipment that is never cleaned. In some operations, it is just not possible during a normal shutdown to take apart and open certain pieces of equipment for cleaning. In the event of a recall, it means that there never was truly a clean break. FDA looks to companies to inform them on when the last clean break occurred. With a clean break, a company has evidence to shorten the span of a recall back to that last clean break. This reminds me of a company I was in that had four large tanks of melted chocolates, and the different chocolates were drizzled on the top of the product. It was heaven for this chocoholic, until I learned that the large tanks were never emptied. Never. This is standard practice throughout industry. The company had a clever way of cleaning the equipment that dispensed the chocolate, but not the mother tanks. The question becomes: in the event of a recall, would the company recall all product in market with that particular chocolate? Without a clean break, how does a company determine how far back to go for a recall? One way to determine the cut-off date is to stop production, call in a consultant to investigate, and collect hundreds of swabs for the determination of root cause. This takes time, and the company has an obligation to inform customers of the recall and may not have enough time. My suggestion to owners of dry operations is to schedule an annual shutdown for repairs and complete cleaning and sanitizing. I know this is a huge cost. 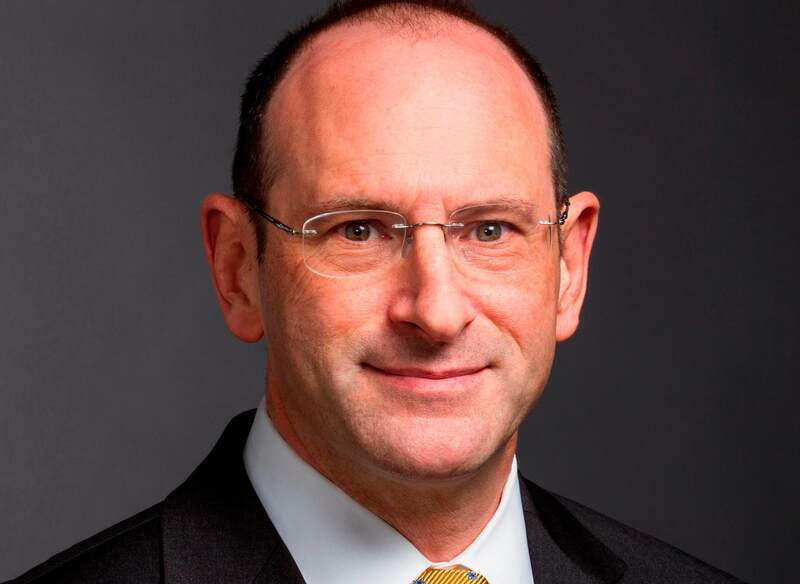 Your CFO can calculate the ultimate cost for this shutdown of production. Then calculate the cost of a recall. In addition to the cost of recalling all product from the market, what is the cost of loss of customers? This Cheesehead is going to continue to learn from clients of dry operations and formulate best practices for cleaning and sanitizing of dry operations. Please share your thoughts with me. Food safety is not competitive. The ConnectFood website has free resources, and the folks at ConnectFood are here to help! The online service allows you to complete a facility hazard analysis. Contact us. July 25, 2018 /by Kathy Knutson, Ph.D. Both the FDA and CDC published updates on the pathogenic E. coli outbreak today. Sadly, one death was reported. This blog post was published earlier in the day and has been updated below the original post. There is an outbreak of pathogenic E. coli in the US. The Centers for Disease Control and Prevention (CDC) through PulseNet, a national database, recognized the outbreak in March 2018 with the initial CDC announcement on April 10, 2018. With the initial announcement, there were 17 cases across seven states with the largest number identified by the New Jersey Department of Health. What do we know about the outbreak? •	The pathogen is Shiga toxin-producing Escherichia coli O157:H7. •	The likely source is Romaine lettuce. •	The Romaine lettuce is from the Yuma, AZ growing region. •	Illnesses started March 13th, 2018. •	98 cases ranging in age 1-88. •	10 patients with hemolytic uremic syndrome, a form of kidney failure. •	65% of cases are females. •	Dozens of farms in the Yuma, AZ region are being investigated. •	When a clinical isolate from a patient is identified as E. coli O157:H7, the result is reported to the state department of health. The state reports the result to the CDC. The isolate is tested by pulsed field gel electrophoresis (PFGE) and the data are entered in the national PulseNet database. The CDC monitors the database and sees the matches across multiple states. There are differences in strains of E. coli O157:H7, and PFGE is used to show matches of the same strain. The outbreaks isolates are also tested by whole genome sequencing (WGS), a method to fingerprint the strains. •	Health departments conduct food surveys of patients to learn foods eaten. For this outbreak, 64 of 67 patients interviewed reported eating Romaine the week before the illness started. •	The Yuma, AZ growing region provides Romaine to the US during the winter growing months. 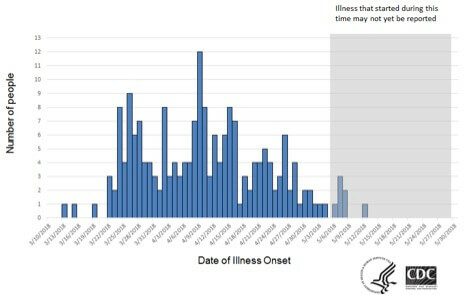 •	The CDC epi curve shows the first case had an illness start date of March 13th. 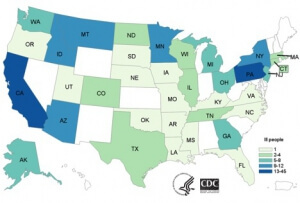 •	The CDC Case Count Map shows the number of cases per state. 1. Onset time is 1-8 days. 2. Duration of the illness is 5-10 days. 3. Medical diagnosis can be 2-3 weeks. 4. PFGE and WGS conducted. •	Watch for another CDC update on the number of cases and hospitalizations. •	The investigators will locate the source of E. coli O157:H7. The isolates will be tested by PFGE and WGS. The results from the source will be compared to the patient isolates to detect matches. •	The number of cases will taper off and the outbreak will be over, due to the end of the Romaine growing season in Yuma, AZ. What can you as a consumer do? •	Do not eat Romaine from Yuma, AZ or if the growing location is unknown. •	Do not eat salad blends containing Romaine, if the growing location is unknown. •	Do not eat salads, if you do not know if the salad contains Romaine. •	As we start the summer season, follow the rules of clean, chill, cook and combat cross-contamination. •	The last reported illness started on April 21, 2018. •	The number of states has increased to 25. •	The number of cases has increased to 121. •	The number of hospitalizations has increased to 52. •	The number of patients with hemolytic uremic syndrome is 14, up from 10. •	California reported one death. •	CDC investigations are ongoing. •	As expected, the growing season is over for the Yuma growing region as reported by the Arizona Leafy Greens Marketing Agreement on April 27, however, Romaine has a 21-day shelf life which puts Romaine with consumers until mid-May or longer. Because of the timeline for illness and outbreak detailed above, additional cases are expected. I want to note that growers who participate in the Arizona Leafy Greens Marketing Agreement implement strict procedures for food safety. The grower who sourced to Alaska is an active participant in the Agreement and highly regarded for compliance in food safety. Participants must have a food safety plan, employee training in food safety, pass an audit and pass inspections. I hope that the source of the contamination is discovered, and the growers will come back even better than they already were. Food safety is not competitive, and we are all in this together. Correction: The original blog stated that E. coli O157:H7 was found from one farm in Yuma, AZ. That is not correct as the FDA continues to investigate the source of the pathogen along the supply chain. FDA traced the source of the Romaine shipped to Alaska back to one farm in Yuma, AZ. May 2, 2018 /by Kathy Knutson, Ph.D.